"Alone we can do so little. Together we can do so much". It is a fact that as we learn to work with one another rather than working against one another, things start getting better. Every successful individual knows that his or her achievement depends on a group of persons working together. Growth never takes place merely by chance. It is only when we acknowledge our passion and take a step forward to nurture them. No matter how rough and inaccessible the roads may be, that we discover our true selves at the end of the road. 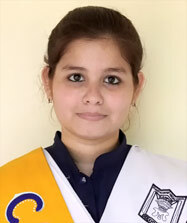 Diligence, Perseverance and faith in god are the pillars of St. Mary's Convent High School which believes in imparting education not only for the mental but also for moral development of girls . 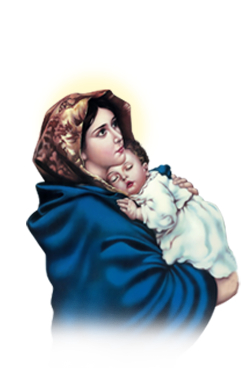 I believe that there is nothing that a St. Marian cannot accomplish. All that we need to strengthen is our resolution and commitment. We at St. Mary Convent High School, Kanpur aim to stand united to keep up the integrity and good name of our school and leave no stone unturned to achieve the zenith of success .Alone we are like a drop of water but together we are like the vast ocean the only condition being that the feet are on the ground and thoughts at lofty heights..
"Words, once written live on forever, not on shuts of paper but in the hearts and minds of men". This saying by T.S. Eliot, applies not simply to books but to any and every form of expression of our true selves as all forms of expression are stepping stones for our development as human beings.. This academic year offers numerous occasion to students for expressing themselves in several competitions on sports field and in the classroom. As St. Marians we have always been taught to be true to ourselves, no matter how adverse the circumstances might be. And it is a fallacy to mistake youth for in experiencing thus, I hope that the students express themselves to the best of their abilities regardless or their experience or lack of it for it is only when we try that we actually learn. 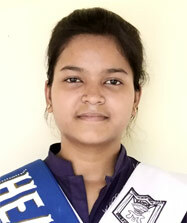 'Lastly , but essentially, I would like to thank Sister Divya, the teaching faculty and all the students for placing their trust and faith in me. "Valuable is the work you do,"
Outstanding is how you always come through trustworthy in every project you take, notable are the contributions you make. Honour , integrity and discipline have been the watch-house of our school. Our school has played a vital role in instilling these qualities in us so as to make us successful individuals who knows how to face the obstacles and challenges in their life. Traffic rules are meant for our safety and have garnered a lot attention from the media in recent times. Time and again people are reminded of the importance of traffic rules. To maintain discipline is a job which requires vigilance and also the cooperation of students. As the traffic pilot of the school it is my duty to make people follow the traffic rules which are in laid by our school for the safety of the students. This task alone cannot be fulfilled by me it requires the cooperation of the students and the help of my co-members who are on traffic duty. At last I would like to request all my peers to help me establish discipline in the campus at all times. Rules are the foundation of change, they create boundaries that prevent you from feeling overwhelmed and guidelines which keep you on track. "Success in not final, failure is not fatal, It is the courage to continue that counts"
Sometimes the smallest step in the right direction ends up being the'STEP' of your life. Tip toe if you must but take that step. With this, percept in mind, I hope to spend my last year in St. Mary's Convent High School. My avarice compels me to learn imbibe and emulate all that I can from this esteemed . institution I hope that every St. Marian embarks on their journey of little steps .May we participate in all activities we can, unless our creative force, let the myriad imagination and innovations come to life. 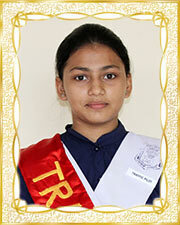 As a leader, I hope to unite the Tagore House and continue the grand streak of success and legacy. I express my heartfelt gratitude to Sr. Divya and entire teaching faculty for vesting their confidence in me .My vocabulary fails me when I try to express my obligations towards them. "Great leaders don't set out to be a leader. They set out to make a difference. It is never about the role, It is always about the goal". "When we have eliminated all that is impossible, whatever remains no matter how improbable must be the truth"
We live a world of countless possibilities and we study in a school that brings all of them to us opportunity presents itself only once, and I am beyond grateful that the school and the students rested their faith in me. 'To be or no to be, is a question that hangs over all of us, when we try to discipline our lives. My dear friends we shall never be able to answer that question but we always know a choice, a choice to choose between right and wrong between what defines us St.Marians and what does not. Let us then be wise choosers, our school trains us to be and live by its coherent principles so we together can take it to the pinnacle of prosperity. Success means nothing without happiness"
Sports and games prepare an individual to expect the unexpected and nurture a resilience that no one can predict the limits of. For a better overall development it is very necessary to stay fit, which can only achieved through physical exercises . 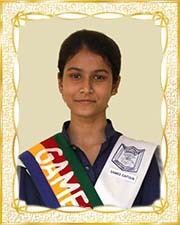 It is an honour to be chosen as the Games Captain of the school. 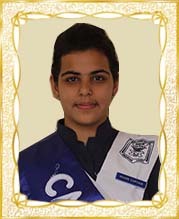 Being the Games captain of the school is a great responsibility and it is my duty to discover each individuals potential in the field of games. In order to excel in this field, it is very important that students of SMC discover their capabilities, use their energy in the right way, have a positive outlook and co-operate with their mates and entire sports team. "Talent wins games, but teamwork and intelligence wins championship"
"Talent wins games ,but 'teamwork' and "intelligence" wins championships"
In our life, each day comes with new challenges and new challenges and new opportunities with determination confidence, hard work and discipline we can achieve the impossible and conquer the challenges of life. Is this match of life, even after many ups and downs we should never give up our hope because as St Marians, we are taught to never lose hope and to rise again as a phoenix, everyday with our efforts and hope renewed as "one defeat is not all ." We must meet new competitors , we must face challenges, we must learn from our mistakes and realize that to grow we must keep challenging ourselves always remember.
" Optimum is the faith that leads to achievement and nothing can be done without hope and confidence." "Every duty is holy and devotion to duty is the highest form of worship of God". The metamorphosis from a timid and meek little girl, to a confident, responsible, diligent and morally developed girl, I owe this transformation to my esteemed school. On behalf of all the office bearers . I entend my heartfelt gratitude to our Dear principal Sr. Divya, vice principal Sr. Shweta, sisters and teachers who reposed their faith in us and considered us worthy of their posts. "With great power comes great responsibility" and I assure that I along with my team of office bearers will leave no stone unturned to enhance the dignity of our school and take it to exhilarating heights". I sincerely thank Sr. Divya, my teachers and all the Nehru House members who found me capable of holding the responsibility of the Nehru House Captain. Pt. Jawaharlal Nehru rightly said, "Loyalty and efficient work is a great cause even though it may not be immediately recognized, ultimately bears fruit." 'The true alchemists do not change lead into gold, they change the world into words'. I feel honoured and proud to be elected as the Chief Editor of my beloved school. I would like to thank our principal, Sr. Divya and the School Management for finding me capable of a position so powerful in nature. The art of writing is the art of discovering ourselves. This year the Editorial Board plans to focus on creative articles that are original and have ability to show the readers what passion for words really mean . The magazine is a blend of memories, nostalgia and events blend directly from the heart, compiled by hard work and love. The board strives to bring you an edition so powerful and intense in nature that it is true. "The purpose of life is not to be happy but to be useful, to be honourable, to be compassionate , to have it make some difference that you have lived and lived well." 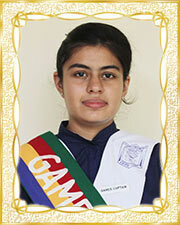 These lives aptly unfold the worth of the crucial responsibilities entrusted upon me as the Gandhi House Leader . My heartfelt gratitude to my Principal, my teachers and most importantly my house members for finding me capable for this post. And to all my house members, I would appeal to put service before self as I truly believe that the smallest of deeds by an individual can move mountains and contribute to making their house stand at a better place. Fuelled with the principles of Gandhiji , I aim to remain determined through the strife with my hardworking house mates by my side, making our house as well as our school proud along the way. "I slept and dreamed that life was beauty, I wake and found that life was duty." These beautiful lines said by E.S Hooper reveal how, when entrusted with responsibility a person evolves into a nature, reliable and strong person . I was extremely delighted to be elected as a traffic pilot of the school for the academic session 2017-2018. On being elected as an office bearer, one gets not only the badge but also the great responsibility that has to be shouldered as the year passes by. My aim will be to overcome all hardships that assail my path along with my team members Kritika Mishra, Iqra , Aalima Mubashir, Khusboo Rupani, Soumya Sharma, Aditi Tiwari, Aarchi Agarwal, Vidhi Kapoor and Yashika Prem. "God has his times for us all"
Thomas Aquinas once commented," If the highest aim of a captain were to presence his ship, he would keep it in port for ever." 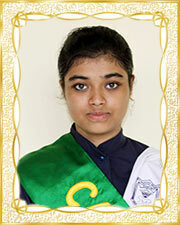 I would like to begin by thanking our esteemed principal Sr. Divya, dear teachers and my faithful housemates. 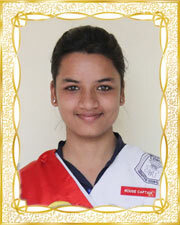 They were the ones who relied their trust on me and gave me the opportunity to represent the Tagore House. I feel blesseth for being given this responsibility and I shall forever be obliged to them. On the commencement of a new term, I pray to the Almighty that this year brings our school remarkable affluence. I hope this term brings us new encounters and aims. Whatever the situation may be, I pledge that I'll act solely in the wellbeing of my house. 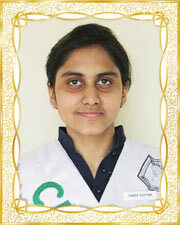 I expect each and every Tagore House fellow to support me in attaining our communal aim of outshining all other houses. We will, together, definitely make our efforts spell success. 2017, being a sports year will bring us many occasions on which we'll stand factual to our axioms. Let the whole school see our house essence. So, I request my house members to subsidise in making our house glorious. Concluding, I pray that sky not be limit of our success.
" Your work is going to fill a large part of your life, and the only way to be truly satisfied is to do what you believe is great work. And the only way to do great work is to love what you do and are willing to do what it takes, its within your reach. It is a matter of pride and honour for me to be the Mary Ward House Captain. I would like to thank our Principal, Sr. Divya and my teachers for having placed this trust in me. I promise to represent my house proudly and strive hard to keep up the school flag flying high. With your ability and talent, my dear House Members, I can assure you that Winning won't be difficult. Also, remember-"He who believes, is Strong ; he who doubts, is weak. Strong convictions precede great actions. So , together we can and together we will take our House to the Zenith of success! Sports is an integral part of our life. It is that aspect which keeps us fit and promotes a healthy lifestyle. I feel elated to have been chosen as the school Games Captain. We all know that this year a very big event lies ahead of us- The Annual Sports Day. The way a team plays as a whole determines its success. You may have the greatest bunch of individual stars, in the world but if they don't play together, the club won't be worth a dime. 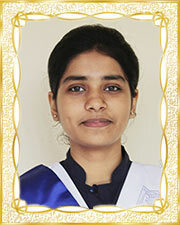 I hope to receive full cooperation from every student and I promise to accomplish all my duties to best of my ability. As a team, we, St. Marians can achieve laurels in the field of sports. I feel blessed and honoured to shoulder the responsibility of leading the basket ball team of this esteemed institution. I would like to thank Sr. Divya and Shukla Sir for considering me capable enough to be the Basket Ball Captain for the 2017-2018. "A leader is one who knows the way, goes the way, and shows the way." Therefore, I will work very hard to make my team a better one and lead the team to success. To my team mates I would like to say that 'Girls, The strength of the team is each individual member. The strength of each member is the team. And with motivation and hard work we can achieve our goals. "Coming together is a beginning, keeping together is progress, working together is success". 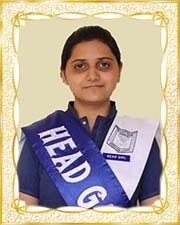 It is a matter of pride and honour for me to be the Head Girl of a prestigious institution as SMC. 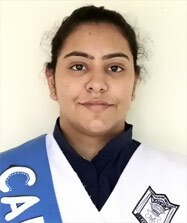 I want to thank the Principal, Sr.Divya, for giving me this opportunity, I, along with my team members will always try to live up to everyone's expectations and strive to excel in all the fields. I request every St. Marian to live up to the motto of our school "Endeavour Counts". Let us pledge to work hard and become better individuals. Let us set higher standards so that sky be the limit for us. Having been a part of the Editorial Board for almost 3 years has made me see the truth of this quotation. Indeed, I feel honoured and privileged to have been chosen as the Chief Editor for this year. I take this opportunity to express my gratitude to Sr. Divya and the school staff for thinking me capable of shouldering this responsibility. I will try to discharge my duties in the best possible way. On behalf of the entire Editorial Board, I would like to spread the message that your innovative ideas, creative articles and sketches are always welcome. Give voice to your thoughts through 'Echoes of SMC' and let us together make them be heard far and wide.
" The way a team plays as a whole determines its success. You may have the greatest bunch of individual stars in the world, but if they don't play together, the club won't be worth a dime" It gives me immense pleasure to drive the spirit of sportsmanship in every St. Marian. I would like to express my gratitude to our dear Principal, Sr. Divya and our coach, Mr. Bajpai, for considering me capable for this post. 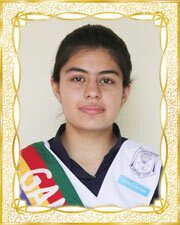 As a team, we, St. Marians can achieve laurels in the field of sports. I feel blessed to be entrusted with the responsibility of leading the basket ball team of this prestigious institution. I would like to thank Sr. Divya and Bajpai Sir for considering me eligible to be the Basket Ball Captain for the 2016-2017. "Leadership is unlocking the true potential of the people to become better". Therefore, I will work very hard to make my team a better one. To my team mates I would like to say that 'Girls, you don't have to hold a position to be a leader. You are your own leader, so lead yourself on the right path. And where there is faith, teamwork and collaboration, wonderful things can be achieved. "Aim for the stars, you'll at least reach the moon. Make unity your strength, don't give up so soon." It gives me immense pleasure to pen down my thoughts right in the beginning of this new academic session and that too as an 'office bearer' of this prestigious institution. 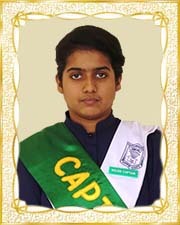 Being a Captain is a great responsibility which shoulders the great task of leading your classmates and juniors. "Without a group of people to lead, you cannot become a leader". We, as a team will lead our house to the exhilarating heights of success and we, as a team will stand true on our house motto "Unity is Strength". "Great leaders don't set out to be a leader. They set out to make a difference. It is never about the role, but always about the goal". As I pen down this message, it fills me with great sense of honour to be voted as the Gold House Captain for the year 2016-2017. 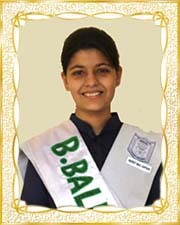 I sincerely thank my Principal, my teachers and most importantly my house members for finding me capable for this post." There is no Captain without a ship". I would like to say to my house members that "success comes to those who dare act, it seldom goes to the timid who are ever afraid of its consequences". As the Gold House Captain, I can assure you that I will try my level best to live up to your expectations and I hope that our efforts together can and definitely will spell success. Doesn't confirm to the usual mould. With thoughts as these tossing in my mind, I began taking the oath as the Green House Captain for the academia 2016-2017. 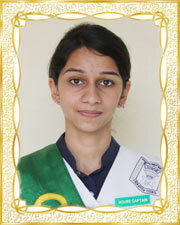 It is indeed, a matter of pride & honour to be elected as the Green House Captain. 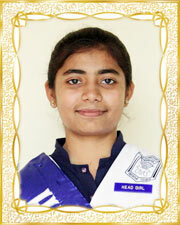 I sincerely thank our Principal, Sr. Divya and my teachers for vesting me with such great responsibility. It is rightly said 'with great power comes great responsibility'. Having been chosen as one of the student leaders, I promise to strive hard to keep up the school flag flying high. I would like to say to my house members that for me, success is not the absence of failure, but the attainment of ultimate objectives. Thus, with the co-operation and teamwork of our house members, we will surely reach the pinnacle of success. I would like to say -Together we can and we will make all our endevour count. Great leaders don't set out to be a leader, they set out to make a difference, what matters is not the role but the goal. These lines aptly unfold the worth of the crucial responsibilities entrusted upon me as a Captain. 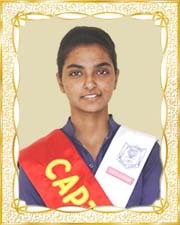 I would like to thank Sr. Divya, the teachers and all those who found me capable as the Red House Captain. I would like to tell the house members that let this new academic year be an opportunity for us to show our capabilities & potential. Let us show that when a Red House member makes up her mind, she can take her house to the zenith of success. History bears testimony to the fact that with great powers comes great responsibilities. It is thus, a challenging duty to mind the traffic coming in the school and take care that the children go safely back to their homes. 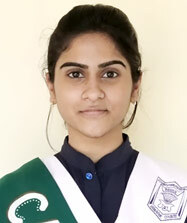 Thus, I take this opportunity to thank our Principal- Sr. Divya, the school management, and the teachers who found me capable enough of being the Traffic Pilot of the school. I promise to abide by all the rules and regulations and fulfill my duties with zeal and enthusiasm. I request my team members to co-operate with me and make this year a success. It is said that with great power comes great responsiblity.And I feel blessed to be entrusted with the responsiblity of leading the entire school body of this prestigious institution. For this , I shall be forever , indebted to my school and to my teachers. Let this year be the time for you to show your capabilities and potential , the time to show that when a St. Marian makes up her my mind , she can change the society . But above all , let the world see that "ENDEVOUR COUNTS". So , let us together take our school to greater heights and contribute to the glory of our institution , our SMC . "Write to be understood, speak to be heard, Read to grow". Reading and writing is a continuous process. There is no age limit for reading because when we read we learn something new everyday. 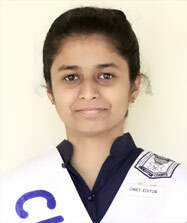 I feel proud to be elected as the Editor - in - chief of my school for the academic session 2015-2016. 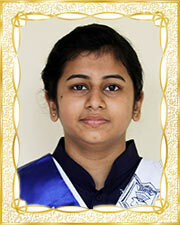 I would like to thank our principal, Sr. Divya and all the teacher's who found me capable for the post. I want to assure my co - mates that i shall fulfill all the duties entrusted to me to the best of ability. All i need is the enthusiastic support and cooperation of my peers. Innovative ideas, informative articles for our magazine will always be welcomed by the editorial board. 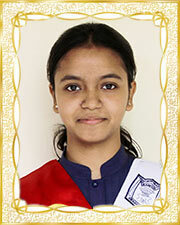 I am sure that our little efforts together will make our school magazine a success. Sport is an integral part of our life. It is that aspect which keeps us fit and promotes a healthy lifestyle. I feel elated to have been as the School Games Captain for the second time. I would like to thank our dear Principal Sr. Divya, Mrs. P.Shukla and Bajpai Sir, who gave me this opportunity and found me eligible for this post. I promise that I will make sure that team spirit is instilled in each student of our school. Michael Jordan, a famous basketball player from America has said, - 'Talent wins games, but team work and intelligence wins championship'. Eleven years on this enigmatic institution have indeed been truly remarkable. But this journey reached its pinnacle on 25thApril, 2015 when I was vested with great responsibility of being the Blue House Captain. 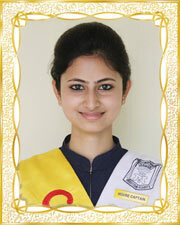 I sincerely thank Sr. Divya , my teachers and all my co-mates for their well wishes. "A Leader is not the one who walks before his team, but the one that walks with his team and still stands out". I promise to fulfil all my duties with diligence so that our house achieves excellence in every task .We shall live up to our motto "Unity is Strength" and always aspire to keep 'The Blue Flag Flying High'. As I pen down my thoughts as the leader of Gold house, a plethora of feelings overwhelm me .Everyday when I see my house captain badge, I am reminded of the honor and responsibilities that were entrusted to me on our Investiture ceremony that was held on 25th April 2015.Being the Gold house captain, I assure my house members that I will try my level best to keep up to their expectations and make our combined efforts spell success!! "Being a leader is not an easy part and winning is yet another difficult part". As the Green House Captain I just want to convey to all my house members that I shall work according to my house motto "Truth Alone Triumphs" which means Satyameva Jayete. A good captain knows the value of the sportsmanship and games. "He who knows how to obey will know how to command" and this year being the sports year I believe that we should love our game ,what matters is the spirit of participation winning is yet another story. I hope that I along with the members of Green House will together form a great team because the difference between success and failure is a great team...!!!!!!! I am truly honoured to be appointed as the Red House Captain of the school for this year. I sincerely thank Sr. Divya, my teachers and my housemates for finding me capable for this post. "Coming together marks a beginning, keeping together marks progress and working together marks success." So, it is all of us, who, if work together as a team can lead our house to great heights of success. As our motto says, "On Wings Of Loyalty", all of us need to stay loyal to one another and to our house on thewhole. And I believe with your full support and cooperation we can make this possible and we will. Sometimes the smallest step in the right direction ends as being the biggest step of our life .Tiptoe if you must, but take the step. This is the lesson I have learnt from my school life. I thank Sr. Divya for placing her trust in me when I was unsure of myself. Her decision to appoint me as the Traffic Pilot has invoked in me a great sense of responsibility and pleasure. Responsibility, to fulfill all the expectations which the school has from me, responsibility to make the students know the need and importance to follow the traffic rules. Isn't it easy to walk leisurely on the road? But it is difficult to make the people to walk at the sides. 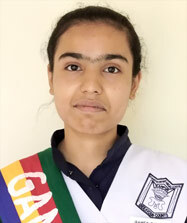 As it is said that a pearl alone cannot make the necklace , likewise , I alone cannot do anything without the support of my co-members who are :- Astha Gaur (12-A) , Ayushi Parashar ( 12-A) , Mridula Jaiswal (12-B) , Riddhi Jain (12-B) , Tanzeel Ali (12-C) , Ayesha Saleh (12-C) , Atika Ansari(11-A) , Aisha Mariyam (11-B) , Chanchal Poddar(11-C) , and Zainab Ahmad (11-C) . I would like to conclude by saying that whatever we do, we should do our best. Ring out far and wide..."
Indeed, they ring beautifully today, they rang gloriously in the past, and they'll ring triumphantly in the future, provided, we carry forward this legacy as a strong, united team. Penning down my message as the leader of this enormous team, I think of the eleven splendid years in which our school made me the person that I today am. I am reminded of the lessons of truth, punctuality and discipline that this school taught me, but I'd like to share another important lesson I learnt here. It says, "A team may work and prosper without a leader, but a leader can never exist without the team." Friends, I ask for nothing but your faith and cooperation, and this being given, I can assure you that we shall be able to amplify the existing glory and prestige of our school by leaps and bounds. In my middle school, when I first read the proverb "pen is mightier than the sword", I felt highly captivated by these lines .But, it is now, in the 12th year of my school life, when the meaning of this thought has become more evident in my mind as I feel proud to be appointed as the chief editor of the school for the academic session 2014-2015. I assure all the members of my school that our school bulletins will serve as a perfect replica of our thoughts, experiences and innovations. I hope for an enthusiastic support from each one so that we can be successful in all our undertakings towards the school and the school bulletins and I am certain that with our efforts we will once again prove to the world, "The power of Literature." Ten years in this exemplary institution has been the golden epoch of my life and being entrusted with the duties of the Games Captain has indubitably ameliorated the gorgeousness of the unforgettable journey. The responsibility of the Games Captain is certainly not easy especially when my predecessors have fulfilled it so gracefully and perfectly. Filling in their shoes would be a tough nut to crack. However, I intend to give my best and face all the challenges with full enthusiasm. 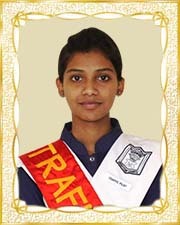 I thank Sister Divya, Sister Lata, my teachers and my companions for having faith in me. Sports and physical activities are an inseparable part of our lives and school days which include sports achievements make the days more memorable. S.M.C has already made a mark in sports due to the efforts of Mr. Bajpai and Mrs. P Shukla and I am to take S.M.C to heights of glory in days to come with the help of the cooperation of my juniors and my fellow mates. In the end I would first like to say that with great power comes greater responsibilities and I vow to fulfill them with full zeal and fervor. As I pen down my experience of the new responsibility of being the blue house captain, I am reminded to those past years when I first stepped in this emblematic institution. So soon the years past by and reaching the last year of my school, there was another one of the most beautiful moments of my school life. I am thankful to our principal Sr.Divya, to the staff and the management of the school for placing their trust in me and to all my house members who found me capable of holding the responsibility. And at last to keep up with the motto of my house- "UNITY IS STRENGTH". The youth of today are the powers of the nation. They are the pillars which lay the foundation of the society. So the y should be aware of their responsibilities and surroundings. So dear friends, today it is us who have to be a guiding light for others, for each and every step taken by us, changes our life each time. "BELIEVE in YOURSELF, have faith in your abilities. With humble and reasonable confidence in your own power, you can be SUCCESSFUL". We can be Successful. And God willing, we will be. "All glory comes from daring to begin for its a new chance to rebuild what you want. "I choose to close the door to the past, open the door the future, take a deep breath and step on to start the next chapter in my life. I owe my sincere thanks to my Principal, my teachers and most importantly my housemates for finding me capable enough for the post of Gold House Captain. 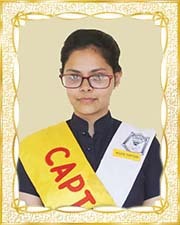 For they say "A leader is the one who knows the way, goes the way and shows the way and being the Gold House Captain I need the confidence and courage to tough decisions and the compassion to listen to the needs of my housemates which I will be able to do with the never ending support and cooperation of my moderator Mrs. M Shukla and Vice Captain Swati Yadav.The moment is right here, right now to make the Gold House glitter with sparkles of success. 2nd May, 2014 the day the Investiture Ceremony took place when the badge of the House Captain was pinned on my uniform and the flag was handed to me, I felt I was called on to write a new chapter for Gold House for 2014-2015.The chapter which shall contain the stories of success, achievements and more... A new chapter which will create more leaders and it will be an honour to be a part of that chapter. "Don't be pushed by your problems, be lead by your dreams." 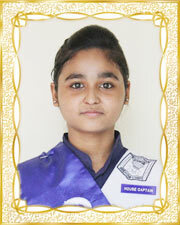 "As the captain of green house, I have been shouldered and trusted with immense responsibility. It takes hard work and determination to bring our house and school name to glory. I assure my teachers' and my dear housemates that we together on the path to truth will surely make it triumph. The road to success will never be easy; it is only us who can change its route. Hard work, team spirit and cooperation are all we need to reach the zenith of success. Walking down the memory lane, as I recall the eleven years spent in this prestigious institution, I am reminded of all the values and advices given to me by my teachers and now it's time to put them into practice. Today I feel honoured when I have been given the responsibility to lead my school as the Red house captain for the year. I'll try to make sure that we all work as a team and lead our school towards the steps of success. As our house motto suggests, we'll always be loyal to our school - "ON WINGS OF LOYALTY". "Team work divides the task and multiplies the success"
Reliving the twelve years that I have spent in this school makes me nostalgic and helps me realize how much this institution has contributed in making me the person that I am today. A saccharine song of the undying love of the teachers and my companions will always be cherished by me. Being the highest accolade of my life, the post of Head Girl has set alight my spirit to pay the debt to my teachers and my school. It encourages me to discharge my duties to the best of my ability and bring about a revolutionary difference in the surroundings. I am for justice, no matter who it is, for or against. I am for whoever and whatever benefits my school as a whole. "Good leaders create a vision, articulate a vision and passionately owns a vision and turn it into a reality" - Jack Welch. I being the chief editor, make a promise to the school that through my determination, perseverance and hard work, would undertake any task entrusted to me by the school authorities and fulfill it in the best possible way. Coming to the school magazine, I expect full cooperation from my fellow students and peers. New ideas, new sections in the issue of SMC TODAY are always welcome by the Editorial Board. The editorial board is looking forward to make this magazine a vehicle for students to express their innermost thoughts. I hope this magazine goes on to become the "lingua franca" of our school. And this is what we preach. We all know that this year a very big event lies ahead of us - The Annual Sports Day. To be united and to work as a team with the spirit of sportsmanship is the key to success. An individual alone cannot do anything .Together we can and we will make this year and the Annual Sports Day a successful one by accepting things as they come and putting our best efforts in whatever we undertake. I hope to receive full cooperation from all the athletes and the sportspersons to prove our skills and talent on the field. We shall work hard for the Glory of God and Sports. S.M.C. has given me so much as a student and as a member of this institution . Now as i have entered in the autumn of my school life,this school has given me the opportunity to lead blue hous as its captain . 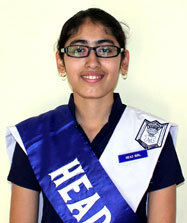 Its an honour for which i would like to thank the school management and the students. It elates me to see the faith and confidence that everybody has shown in me. Blue house members have always stood up for te right thing and this year also they will continue to do so. I believe blue house possesses powers of various sorts which it usually fails to use. I consider my ability to arouse enthusiasm among people the greatest asset I possess, and the way to develop the best that is in a person is by appreciation and encouragement. Compared to what we ought to be we are only half awake,but with earnest efforts we can achieve success and blaze a trail. Walking down the aisle, with the green house flag held high, reminded me of the day when I had first entered the portals of S.M.C. 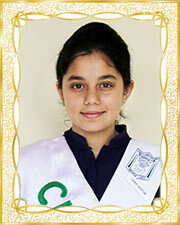 Then I was a diffident child but now I am a confident girl and for this metamorphosis I would like to thank my school. With the commencement of the new session ,I am expecting the whole hearted cooperation of the house members so that together we can excel in every task we undertake and work according to the house motto - "TRUTH ALONE TRIUMPHS"
"IT IS NOT THE LEADER WHO MAKES THE DIFFERENCE BUT THE PEOPLE HE LEADS WHO MAKE THE DIFFERENCE". During my eleven years in SMC, I have been schooled by my Principals, Sisters and teachers to have faith in God and in myself to face a challenge with fortitude and willpower. I have been given the responsibility of being the Red House Captain, and I am now endowed with an unquenchable thirst to make a difference. Being aware of the distinguished paradigm of our school in the field of moral values and discipline, I am filled with a feeling of apprehension and anxiety, hoping that my endeavor in fulfilling the duty entrusted to me will be fruitful. A feeling of responsibility looms large, but I am not afraid, as I share my yoke with my friends and house-mates. Dear friends, a lot awaits to be done. The year ahead brings with it many challenges and stiff competition. Each day would bring a new hurdle and we have to prepare to deal with every trial, every ordeal, with perseverance and determination. With your ability and talent, and full support to your captains, I can assure you that winning will not be difficult. And remember always, "The man who wins is the man who thinks he can". So be optimistic, work hard to overcome your own weaknesses, and you're a sure shot winner! As I enter the last year of my school life, I am vested with huge responsibilities.... responsibilities towards my school, my house, its members, my teachers, and my peers. As I look back on the by-gone years I see myself as a meek and an inhibited girl who has now transformed into a confident person. 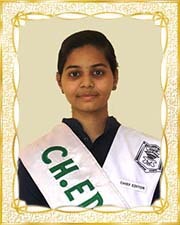 I am obliged to my school and my teachers for bringing about this change in me. I am very thankful to my school faculty to have entrusted me the responsibility of leading my house. As the captain of Gold House, I shall strive to put in my best efforts in whatever way I can to make my house reach the zenith of success as "To work for a team is to work as a team". It has only been six years since I stepped into the warm and welcoming confines of this school, and I can affirmatively say that the journey from a new, frightened little girl till today, sitting here penning these words as the Head Girl of the school had been both remarkable and salutary. I can feel the vast metamorphosis I have undergone. This school has made me what I am, and now, it's my turn to give back whatever I can to my Alma Mater. 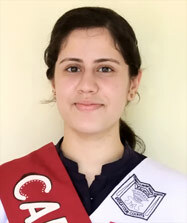 I promise that I will fulfill my duties faithfully and diligently, and I will strive to further the cause for which this institution stands for - to inculcate empathy, morality, and discipline in the students and to produce righteous individuals for the society - and for that, I look forward to the cooperation of everyone in this school. Thus, I thank our dear principal, Sr. Evelyn, and the staff of this school for their support and guidance, and I assure them that I will not disappoint. And to the students, I would just like to request them to trust me and believe in me when I tell them that together, we will work harder than ever, and will take our school to the dizzy and exhilarating heights of success.